IBEW 1245 members are not the first workers to see their jobs threatened by a changing industry. In the early 1800s English textile workers known as Luddites smashed and burned the machines that were replacing them. In the 1900s machines replaced huge numbers of American workers in agriculture and manufacturing. Studies now predict that perhaps a third of present-day jobs in the United States could be performed by robots within the next 15 years, including many construction and customer service jobs. New ways of doing business are now sweeping through the utility industry, shaking up traditional assumptions about the work and who will do it. In these uncertain times for utility workers, is it possible to protect our work, our livelihood? The short answer is “yes,” and we can look to the Longshoremen’s “Mechanization and Modernization Agreement” of 1960 to see how organized workers protected their job security even as new technology and work methods dramatically changed the nature of their work. Longshoremen are the waterfront workers responsible for loading and unloading cargo from ocean-going ships. Following a long and bloody strike in 1934, longshoremen along the Pacific Coast organized themselves into the International Longshore and Warehouse Union (ILWU). It was the leading edge of a great labor uprising that included the utility workers who organized IBEW Local 1245 at Pacific Gas & Electric in the 1940s. A cargo of coffee being hoisted by a sling. Photo by Otto Hagel. Longshore workers of that era had several things in common with workers in the utility industry. The work was physically demanding and was performed almost exclusively by men. There were formal classifications of workers based on experience, with apprentice linemen aspiring to be journeymen, and “B” longshoremen aspiring to be “registered” longshoremen. Work in both industries required strength, skill and teamwork, and could reward inattention with crippling injuries. And because longshore and utility work were vital to the economy, work stoppages were potentially very disruptive. 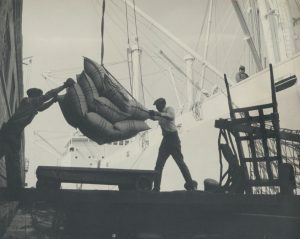 Longshoremen rigging cargo in 1953. Under the leadership of Harry Bridges, longshoremen were not shy about using their economic leverage. After the 1934 strike and through the 1940s, the ILWU won rules to make longshore jobs safer and more secure. The union established minimum sizes for crews—or “gangs”—and welcomed mechanical innovations that lightened their load. 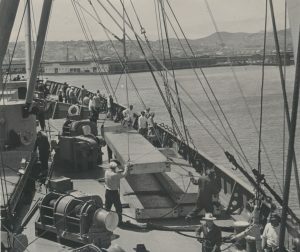 In addition to the traditional hook, these innovations included rope slings, pallets, fork lifts and other specialized devices to ease the handling of various types of cargo. The bargaining power of the union made it possible for longshore workers to become part of America’s expanding middle class, and mechanical innovation made it more likely these workers could reach retirement with their bodies intact enough to enjoy it. By the late 1950s, however, it was becoming clear to the longshoremen that “the machine”—today we might say automation, or perhaps technological innovation—had the ability not simply to lighten their load, but to take over their work altogether. Prior to the 1934 longshore strike, bosses held almost all the power at ports along the Pacific coast. They coordinated their actions through the Waterfront Employers Association (later known as the Pacific Maritime Association) and they dominated their workers through various practices. In the “shape up” each morning, men had to ask the bosses for work—giving rise to rampant favoritism and discrimination in awarding jobs. In a practice known as “speedup,” bosses required the men to work faster. Bosses also had the power to require long shifts on the waterfront, where workdays of 36 hours were not uncommon. These were time-honored techniques to wring more work (and profits) out of the workers. The employers created a “company union” to keep control over the workers, who were required to carry a “Blue Book” showing their membership in this phony, management-dominated union. Many workers hated this book. They referred to it derisively as a “fink book” and viewed it as a symbol of their oppression. 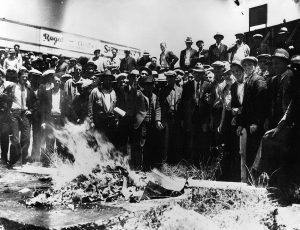 In September of 1933, a mass of longshoremen walked off the job and burned their fink books in an empty lot along the waterfront. It was a dramatic display of unity and strength, and set the stage for their 1934 strike. The strike shifted power to the workers. In settlement of the strike, a federal board created a coastwide contract that recognized the union’s right to represent the longshore workers and negotiate on their behalf. The settlement created union-controlled hiring halls, equalized work opportunities and formalized a regular workforce of “registered” longshoremen. The settlement also established a six-hour day, which was intended to spread the work among more men during the Great Depression that was ravaging the country. 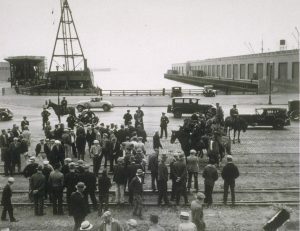 Police surround striking Longshoremen during the 1934 strike. The union and the employers did not settle into a conventional bargaining process until the late 1940s, after the end of World War II. But the organized longshoremen did not need conventional bargaining to assert themselves. They frequently stopped the work to gain better working conditions. For example, longshoremen put a limit on the number of bags, boxes or barrels that could be loaded onto the longshore board. (This board was then hoisted into–or out of—the ship using a sling.) By limiting the load, the longshoremen made it harder for the boss to “speed up” the work of the men down in the hold, whose job it was to remove the items from the board. Job actions were not viewed as a last resort by the longshoremen, but as a routine way to deal with objectionable conditions. In the years leading up to World War II, hundreds of job actions led to a proliferation of local rules at the various ports. For example, in Los Angeles a rule provided that men working on the dock could not be transferred to ship work. The rule was not as arbitrary as it might first appear. It was designed, in part, to protect the older men or men with injuries who could do the easier dock work but could not do the ship work. This growing body of rules irritated the hell out of the employers, who believed that the rules were hindering productivity (and profits). The solution, they came to believe, was mechanization. It was time to start replacing men with machines. And rapid advances in mechanization had begun to make that possible. 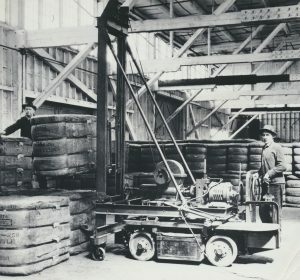 This “grandpappy of the modern forklift” at the Port of Seattle shows cargo handling and storage methods in the 1920s. For longshore workers, mechanization had two faces. It could make their work easier, but it could also make their work disappear altogether. Under pressure to increase production for World War II, waterfront employers began using lift jitneys, more commonly known today as fork lifts. Fork lifts speeded the movement of a sling load of cargo to and from the ship’s hook. Fork lifts could also create higher piles of cargo, a more efficient use of dock space. But there was a downside for longshoremen. Much cargo was already on pallets when it arrived at the dock for temporary storage. Moving that cargo from dock storage to the ship had traditionally employed many dock workers, part of the traditional “long gang.” The new method provided work for just one person: the forklift operator. Without a doubt, “the machine” was going to increase profits for the employers. The question to be decided was whether the workers were going to stand in the way of that profit—or claim some of it for themselves. One radical improvement that promised to cut costs and increase profit was the adoption of bulk-handling for cargo, such as grain, ore, scrap metal and sugar. 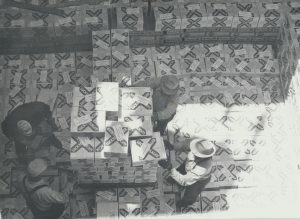 Sugar was first shipped in bulk from Hawaii to the West Coast in 1942. Up until then, unloading a 10,000-ton load of sacked sugar required seven shifts of ten hours each, worked by five gangs of longshoremen: 6,650 manhours. 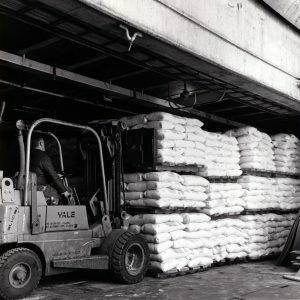 By the 1950s, with all sugar being shipped in bulk, unloading the same load required just 1,000 manhours. The workforce needed to handle the warehouse end of this sugar haul was cut from 80 workers to just eight. Similar processes were devised for other bulk loads. Before mechanization, ore was shoveled by hand into buckets and tubs. With mechanization, a payloader could bull the ore into the square of the hatch, where a “clamshell” could then move up to 13 tons at a single bite. Large blowers could be used to move grain; giant magnets could move scrap metal. 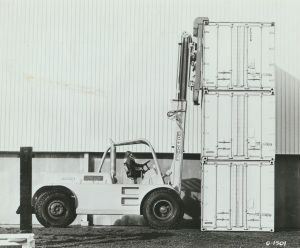 A crane operator handling containers in 1978. Another development that made longshore work more efficient was the unit load. Instead of sacks or boxes or sticks of lumber being handled piece by piece, these items could be handled in units of a ton or more. Cartons of beer could be glued together; loads of lumber could be strapped together. And it was just a short leap of imagination to realize that virtually all products could be handled in bulk if they were packed into uniformly-sized containers. Handling cargo in containers dramatically improved efficiency. 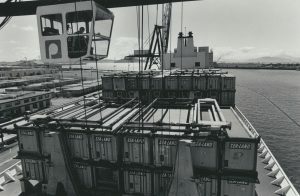 Containerization was a revolution in cargo handling. Containers could hold 25 to 40 tons of freight loaded at a factory or distribution point. With a fully containerized ship, a dockside gantry traveling the ship’s length could be used to reach all hatches. The job of the longshore operator was simply to stow a container of outgoing cargo, then pick up a container of incoming cargo. The only other longshoremen needed aboard ship were those who lashed the containers into place. Containerization, by one early estimate, was increasing the productivity of longshore labor by an astonishing 40 to 50 times. Harry Bridges was the founder of the ILWU in 1934 and its undisputed leader until his retirement in 1977. Harry Bridges was the founder of the ILWU and its undisputed leader until his retirement in 1977. It is safe to say that he was revered by the men he led. But the ILWU was a highly democratic organization, whose character was forged in the militant worker uprisings of the 1930s. At its core was a deep-seated belief that the members as a whole should have the controlling voice in union affairs. Bridges could not simply dictate the union’s response to mechanization of their industry. He knew the members themselves would have to decide the issue. In many respects, the ILWU closely resembled another union coming of age in that era: IBEW Local 1245. Both unions were born in the great spasm of industrial organizing in the 1930s led by the Congress of Industrial Organizations (CIO). 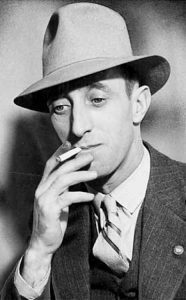 In fact, just three years after leading the Longshore strike in 1934, Harry Bridges was tapped by the CIO to guide an organizing drive at Pacific Gas & Electric. By 1941, that organizing drive was being led by another CIO young bull named Ron Weakley. But during the 1940s, both Bridges and Weakley became fed up with the increasingly autocratic leaders of the CIO unions, some of whom were trying to advance their own careers by accusing their rivals of being “communist.” This unprincipled, scare-mongering tactic—known as “red-baiting”—resulted in the ILWU being expelled from the CIO. Ron Weakley threw himself into the organizing drive at PG&E in 1941 and later led IBEW 1245 as business manager until he retired in 1971. Red-baiting prompted Ron Weakley to leave the CIO in 1948 and to throw in with the IBEW in his ongoing quest to organize PG&E. Bridges supported Weakley throughout this period, and even offered office space at the ILWU to Weakley and his fellow PG&E organizers. 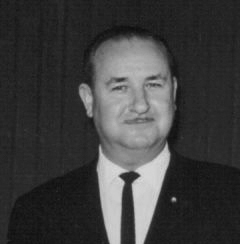 This strategic alliance continued into the late 1950s, when Weakley and Bridges made joint media appearances to combat a Right-to-Work ballot measure. During those same years Weakley watched with interest as Bridges tried to find a solution to mechanization that rank-and-file longshoremen would accept. In Part 2 of “A Share of the Machine,” the story continues as Bridges tackles the challenges of industry mechanization. Look out for Part 2 in February, 2018. Eric Wolfe was communications director for IBEW 1245 from 1990-2016. Robin Walker, Librarian/Archivist for ILWU, provided generous access to the ILWU’s document and photo archive for this article.